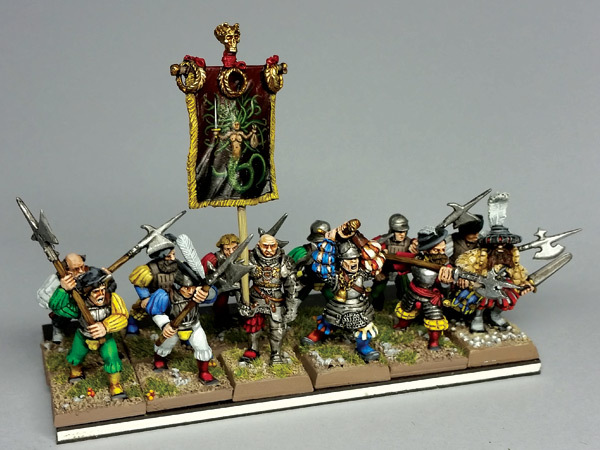 I finished enough halberdiers for two small units, using some previously painted command figures. Mostly 4th ed. era Citadel plastic, but I snuck in a couple of Artizan landscnecht pikemen equipped with Foundry halberds. Also, one old Grenadier hobbit with a bow, to mix in with some previously painted Goblin Factory hobbits, for a small (heh heh) unit of scouts. These are beautiful. 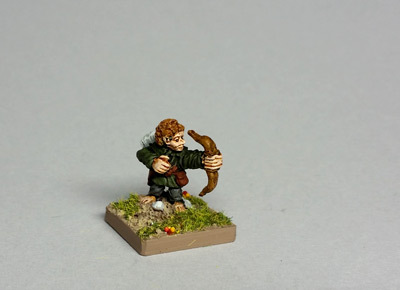 I'm in the process of painting up my effin cool halflings and just splurged on a couple of Reaper ones. The height variation is interesting. This also makes me realize I need to paint more good guys. Yeah, the variety between halflings is pretty extreme, even within the same manufacturer sometimes. I've been hoping/waiting for someone to release a large & cohesive range of halflings to form a "core" around which others could be added. I was briefly excited about Goblin Factory, but that never seemed to get completely off the ground. But I'm currently throwing all my money behind Westfalia. Nice variety, a ton of figures on the horizon, great sculpts and a nice "middle sized" scale to the figures. I think a number of other small ranges/individuals will fit well with them. I think I mentioned this in a previous entry, but I spend a couple days a week working just down the street from the shop Effin Cool is based out of. (FWIW, the man behind Effin Cool seems like a really great guy, too.) Unfortunately my schedule does not sync up with the days the shop is open. Still, I hope to drop by sometime and pick up some of their halflings. Pffft, my stalwart Ld7, Cl7 humans fear nothing. Or... at least just barely squeek into a "don't run away majority" in terms of probability. Regardless, they will still look fashionable and flashy whether they stand or run, and that's all that really matters. Excellent as always - I remember painting a 4th army up with my son when it came out. Thanks! I was wrapped up in other armies when 4th came out, so it took me a while to get around to Empire. I think I started collecting a bit around 5th, but didn't really paint & play til 6th ed. Lovely paintwork. The banners (I know they are old) are absolutely stunning. Gorgeous halberdiers! I'm surprised how good the 4th Ed plastics look mixed in. I might have to revise ideas for my units based on that. The 4th ed. multi-piece Perry Empire figures are easily one of my favorite kits from Citadel. Mix in the old metal bits and they can be equipped with halberds, swords, handguns, or crossbows. They are easy to convert to spear or pike as well. 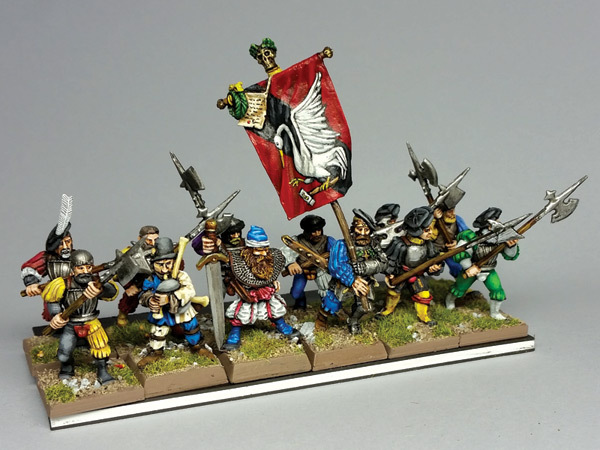 They work just as well as historical renaissance figures, and fit the iconic "puff & slash" landsknecht look that drew me to WFB Empire in the first place. Fantastic! I love the standard, and the way that one's eye is drawn right to the face of the standard bearer. It's a very artistic ensemble. I also love that classic hobbit. Those old sculpts have such a unique (and beautiful) look to them. THanks. Not sure which standard bearer you're referring to, but looking at the pics it just struck me for the first time how much the LE standard bearer in the top pic reminds me of Gru from Despicable Me, since I cut & filed that mohawk off. Haha. These are beautiful! Looking forward to seeing more of your Marienburg army. Have you looked at The Assault Groups Renaissance Range for more potential figures?